Architecture experts say that the Lakhta Center’s new design does not much differ from the original, controversial office building that was planned for Gazprom at the Okhta site. Source: Press Photo. If Gazprom’s skyscraper distorts the historical view of the city, UNESCO might strike St. Petersburg from its World Heritage List. In Russia’s northern capital, authorities have given Gazprom the green light to build its proposed skyscraper in St. Petersburg’s Primorsky District. The decision has not only outraged a number of the city’s residents but has also drawn the attention of the United Nations Educational, Scientific and Cultural Organization (UNESCO). There are concerns that the 472-meter-tall building, which is the center-piece of Gazprom’s future business complex, might mar the historical panorama of the city’s center and disrupt the architectural integrity of St. Petersburg. Gazprom’s construction project, which now goes by the name “Lakhta Center”, was previously referred to as “Okhta Center”. “In June 2011, we took part in public hearings in which all concerned citizens of St. Petersburg could express their comments and proposals,” reports Svetlana Afanasyeva, the PR director of the Okhta Public and Business Center Company. 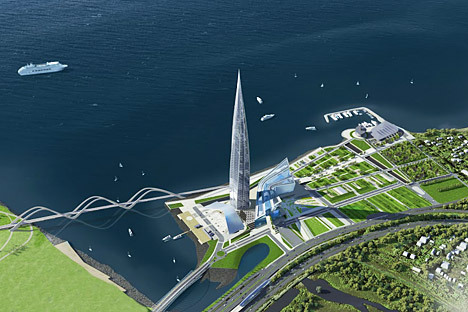 Following the hearings, the Committee for City Planning and Architecture issued a directive, which allowed for the construction of objects of up to 500 meters in height at another location, on the new Lakhta site. In November 2011, the St. Petersburg City Court affirmed the legitimacy of this directive; representatives of the future skyscraper received a construction permit after the project had also been agreed upon by Russia’s State Expert Evaluation Department. Has the Gazprom tower met its match? If the historical integrity of St. Petersburg is found to be violated by the Gazprom construction project, UNESCO might take extreme measures. An experience similar to that of Dresden’s may be in store for St. Petersburg if a special expert commission decides that the image of the historical center has been distorted. “Such decisions are not taken overnight,” says Kalinina. The process may be lengthy and the relevant authorities usually receive a number of official warnings from UNESCO beforehand. “UNESCO has not yet made any harsh warnings because the project is not located in the cultural heritage area or its buffer zones,” Mitrofanova adds. Volchok’s point is this: the skyscrapers’ designers have moved the construction site from Okhta to Lakhta, but a modern skyscraper will nevertheless be visible from many parts of the city. In any event, Gazprom’s tower is unlikely to blend in with the city’s historical center. This article can be read in Russian in the Izvestia newspaper.